Tue., April 17, 2012, 5:36 p.m. ENDANGERED SPECIES -- Tom D. White, 37, and his wife, Erin J. White, 37, of Twisp, Wash., have entered guilty pleas in plea agreements involving illegal conduct relating to endangered wolves. Michael C. Ormsby, United States Attorney for the Eastern District of Washington, just announced the deal in Spokane. On April 4, William D. White, 62, pleaded guilty in the same case to conspiring to kill a protected wolf and send its pelt to a friend in Canada in return for the friend's help in illegally killing a moose. The older White admitted guilt to the charges of conspiracy to take an endangered species, conspiracy to transport endangered species and unlawful importation of wildlife. The importation charge stemmed from the moose, which White brought back to the Methow Valley from Canada, along with a whitetail deer. As part of the overall agreement, William White was fined $38,500 and lost possession of a trap, two guns and any remaining wolf parts in his possession. 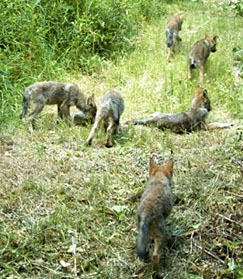 Today White's son, Tom White plead guilty to killing two endangered gray wolves in May and December of 2008. Erin White pleaded guilty on two counts involving exporting an endangered species. The younger Whites each face maximum penalties of up to one year in prison for each offense. But under the agreement, Tom White will pay fines and restitution totaling $30,000 and forfeit the firearm used to kill the wolves. Erin White has agreed to pay $5,000 in fines. The U.S. Attorney is recommending probation for both of the younger Whites. A sentencing hearing has been set for July 11.